Mali Mish - Day 67: Sleeping Bear Dunes National Lakeshore. Day 67: Sleeping Bear Dunes National Lakeshore. Our weekend at Ludington has come to an end and this morning, we are all busy packing up our belongings and getting ready to hit the road again. The girls were sad that their new friends are leaving but we will see them again in a couple of weeks. We are planning to visit them at their homes in Ohio on our way down to Kentucky. Doug and the Troutstream pulled up next to our campsite to bid us farewell and all the kids got together for a photo by the Mali Mish. This is a behind-the-scenes production still of the Troutstream blog. Doug did an awesome write up of the weekend from their perspective. From here, we didn’t know exactly where we are going. We have a couple of weeks before we need to be in Ohio for our appointment to get the Airstream checked out at the Airstream factory in Jackson Center. 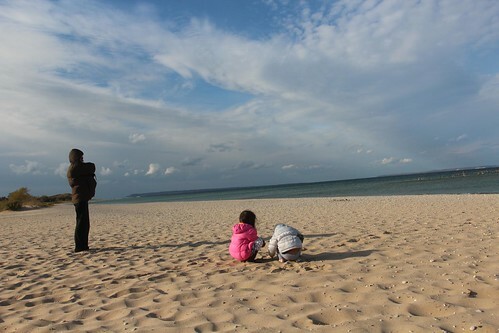 We had heard so many great things about Traverse City and we decided to head north towards it. If it gets too cold, we can always turn around and head back down. 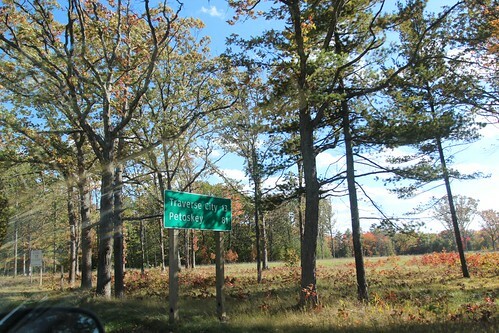 The road from Luddington to Traverse City is through a series of little 2 lane roads surrounded by trees with beautiful autumn leaves. 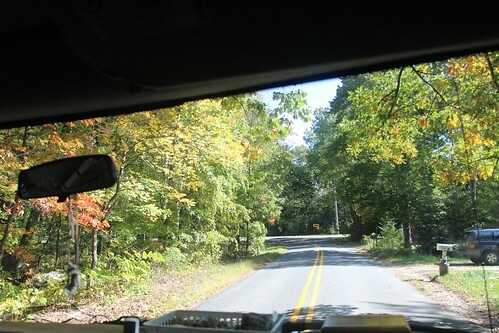 We are close to being in the peak of the fall season and soon all of the trees will be bare. Luka has been spitting up again and we are unsure if he has outgrown his reflux medicine dosage or if Marlene has gotten too careless with the diet. Just to be safe, she decided to tighten up her diet a bit more. 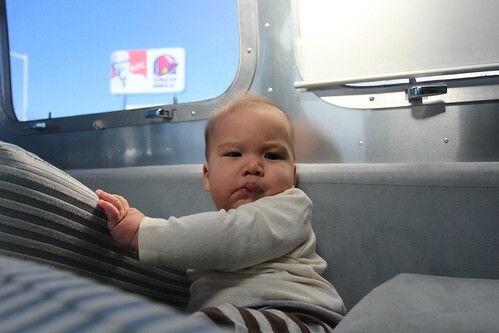 The girls and I went to a Ken-Taco-Hut for lunch on the way out while she and Luka stayed in the Mish and made lunch. The drive is about 100 miles on small roads which means it will take us a couple of hours or more. That is the longest transit day we have had in a couple of weeks. The nice thing about the midwest and east coast is that cities are much closer together than in the west. It is especially nice right now since gas and diesel prices have skyrocketed all across the country. Our friends at home in California are seeing some of the highest prices in the country at over $5/gallon. 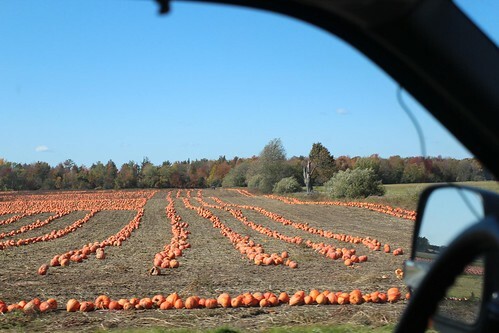 The fall is really here and we are seeing pumpkin patches getting ready for families to visit. 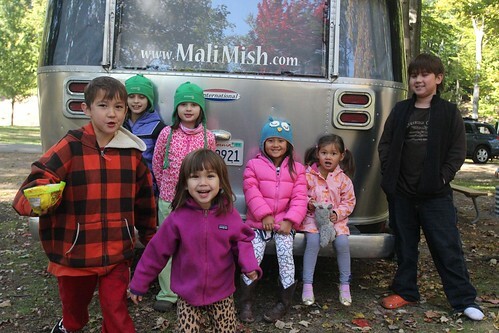 We are going to take the kids to one but probably not until we get to Louisville where we will stay for Halloween. We do not have room for oversize gourds in here. Traverse City is in the northwestern part of the lower Michigan peninsula. It isn’t actually the northernmost place during our trip so far. Technically, Clear Lake, Minnesota was higher up in latitude but we are not far below and definitely later in the season. When we got to the Traverse City area, we really had no clue what our game plan was. We knew there were a lot of cool things to see here but we don’t really have the time to dedicate more than a night or two here. 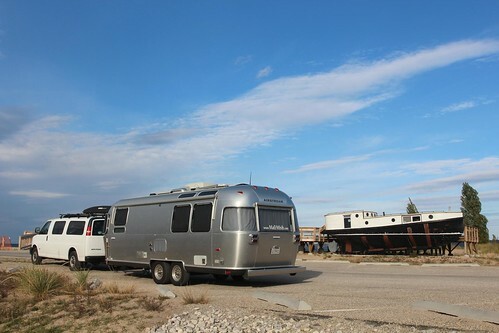 Typically when that is the case, we just boondock at a walmart and drag the Airstream with us while sightseeing. And that is exactly what we did. 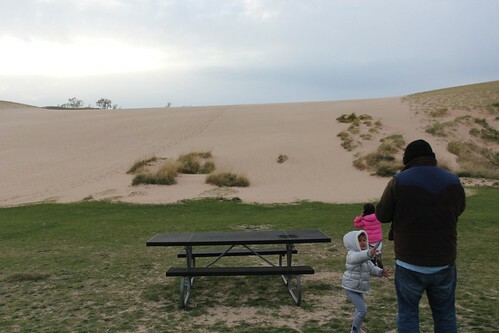 We drove to the northwestern-most portions of the Michigan lower peninsula to check out Sleeping Bear Dunes National Lakeshore. Sleeping Bear Dunes National Lakeshore is located at the Leelanau Peninsula which juts out about 30 miles northward from the lower Michigan Peninsula. It is the ‘pinky’ of the lower peninsula if you are looking at a map with the Saginaw bay forming the space between the index finger and the thumb. 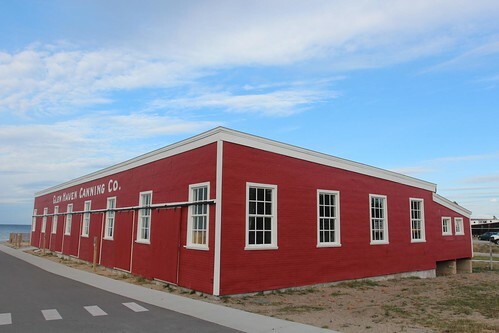 There is a little restored town called Glen Haven that was once a ‘company town’ that operated a logging and shipping business. The sand dunes and beaches continue to surprise as with gorgeous views and beautiful shorelines we never expected to see in Michigan. Just off shore from Glen Haven, the North and South Manitou islands area also part of the National Lakeshore area. Only limited access by permits is allowed during season. It reminds us a lot of the Channel Islands that we lived right across the shore from back at our old home in Ventura. The name Sleeping Bear is derived from a folklore of the Chippewa native Americans. Legend has is that a mother bear and two of her cubs went into the lake to seek shelter from a a forest fire on the opposite shore. When the mother bear reached shore on this side, she went atop of the sand dunes waiting for her cubs that had drowned on their way across. A tree stump that resembled the shape of a sleeping bear rested atop of the sand dunes but has since been eroded beyond recognition. The two Manitou Islands are said to have been created by the Gods to memorialize the baby bears. 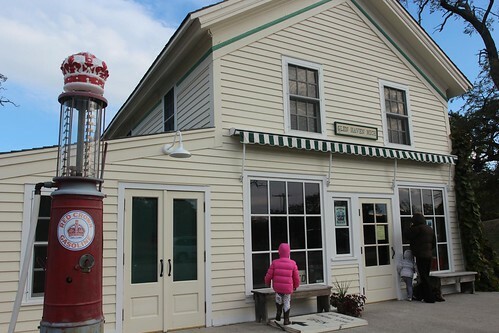 The town of Glen Haven was established in 1857 and served many workers as well as travelers until the 1940s. When the National Park was established in the 1970s, there were still local residents that lived here and they resisted the idea of turning their home to a park. At that time, the government’s stance was that the shoreline here was to be preserved just as the Pacific and Atlantic seashores. Needless to day, National Park Services won its case and it allowed the transfer of land from the former private owners to the public in order to make this park possible. That doesn’t mean there were any holdouts that had to be forcibly removed. The last resident, 70 year old Carolyn Bumgardner, fought the government’s efforts all the way up until November of 2007 when she was evicted from her trailer by the U.S. Marshals through eminent domain as they waited for her to collect her personal belongings. The government had purchased her property for $36,000 back in 1980 and she was given 25 years to vacate which is obviously more than enough time. But the fight clearly was not about the money, it was about her home that 4 generations of her family had lived in. There are still many homes here but none are occupied. 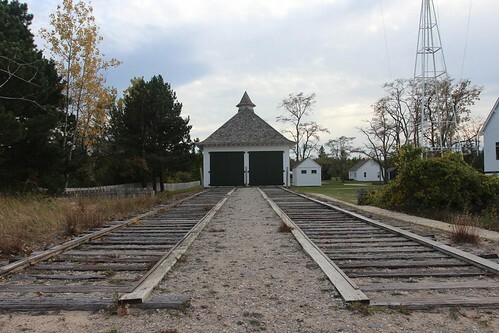 Every resident of Glen Haven has been forced to relocate to make way for the preservation of this historic village. Many of the former residents do not believe that there are enough resources to preserve the town as well as they would be able to but all we can do now is to wait and see. Millions of people visit Sleeping Bear each year but apparently not during the fall. None of the park services were operational and we saw no more than a couple of other visitors at a time while we roamed about. 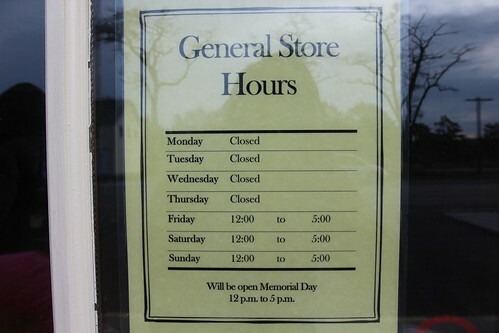 Apparently even when the General Store in Glen Haven is open, it didn’t do so for very long. 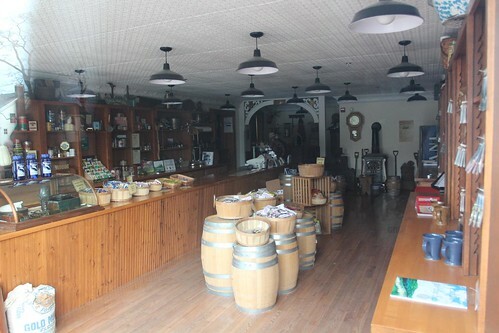 We took some photos through the window of the store just to see what it looked like inside. 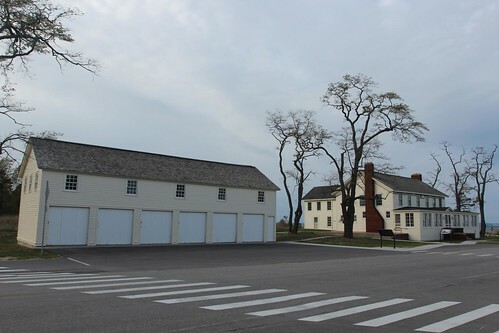 It appears that the the National Park Service did a noteworthy job of keeping the look of the town authentic to its era. 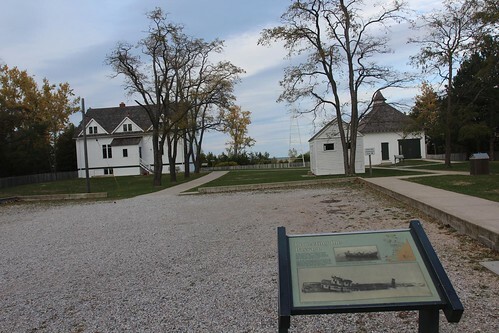 The Glen Haven house was built to accommodate travelers and the garage was built to serve as staff quarters and transportation storage for the visitors. 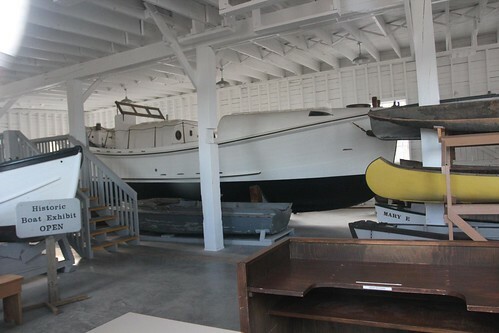 A Coast Guard station was also once a critical part of the Glen Haven life. As many of the visitors and workers arrived and departed by boats, this station and its staff served to protect those that used this port. Since we couldn’t visit the interior of these buildings, we decided to head south towards other parts of the Lakeshore. There are campgrounds here for us to stay in and since we have our annual park pass, it would be very inexpensive. But our time here ultimately is limited as we need to start heading south tomorrow in order to make it to our appointment at Jackson Center. 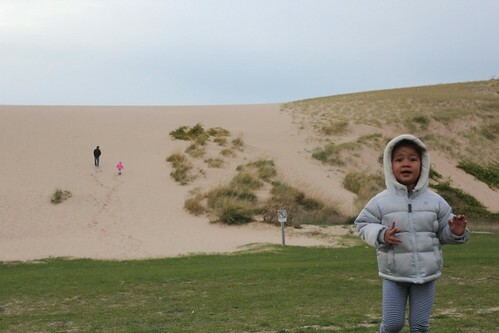 Before we left, we drove down towards the dunes so the girls and I can play in the sand a bit before we head towards town to find a Walmart. This is the dune climb. It costs $10 to just come here for a visit but our park pass got us in free. Actually, no one is at the gate so anyone could have gotten in free today. It was pretty cold today and when the girls got out, Mila immediately changed her mind about coming along. 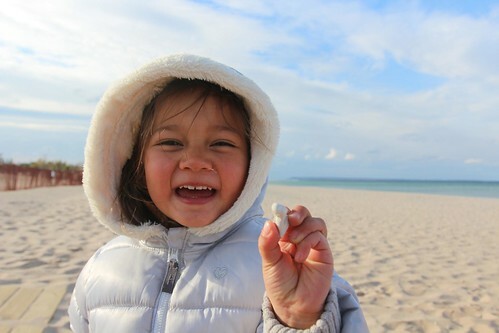 Ava and I climbed up the dunes only to find that there are more dunes to overcome in order to get a view of the shore. As I stood admiring the views from atop, I realized I did not bring anything to photograph it. 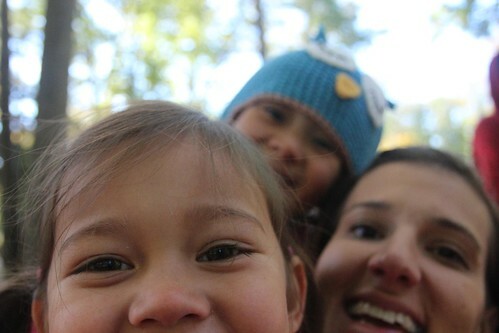 We ran back down to the car and decided to ascend once more with the camera so we can get pictures like this one. The parking lot was nearly empty and to climb the dune twice was well worth it to preserve this moment of our trip on the blog. Day 66: A Beautiful day to hang out with new friends in Ludington. Day 68: Visiting Lake Huron at Bay City, Michigan. 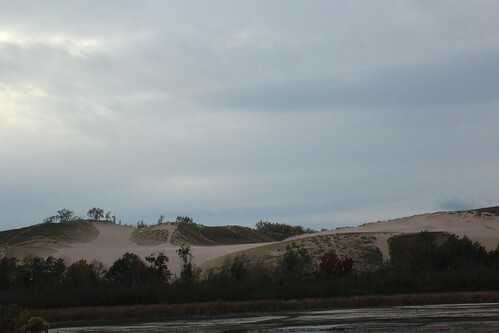 5 Responses to Day 67: Sleeping Bear Dunes National Lakeshore. Hi Amanda! I bet the summer was great here but after seeing Michigan in Autumn, it is pretty hard to beat! We are from the west coast so we don’t have seasons like this 🙂 We did a loop through the DH Day campground and it looked awesome. woodsy, secluded and it has beach access. I too wished we had a few days to spend there but since the phone reception was pretty bad there as well, we had to move on. It looks like you guys are having a blast on the west coast! Safe travels! next time you need to go when the kids don’t need coats! – the beach was swamped when we went there. . . it was so shallow that people were walking hip deep to their boats easily 150 yards out. 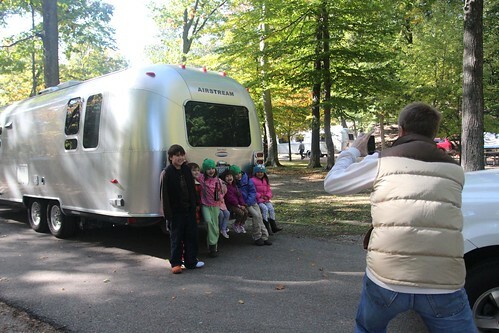 . .
My husband, 3year old daughter and I just bought our Airstream last week, and my fascination with it led me to your blog. Your journey with your family is so interesting! What a wonderful experience for all of you! 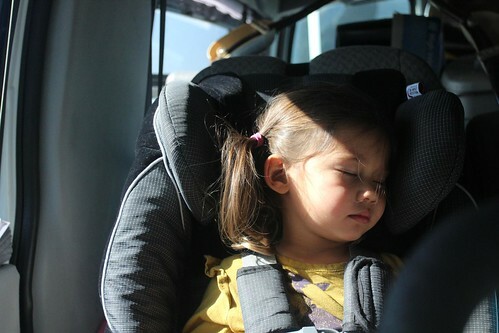 We travel quite a bit as a family too, and we love sharing the joy of discovery with our daughter, Ivy! Oddly, we are heading to Lousville ourselves (plane from Sacramento, Ca) to visit family in November. I’ll enjoy reading your updates! Let me know if you find a playground! 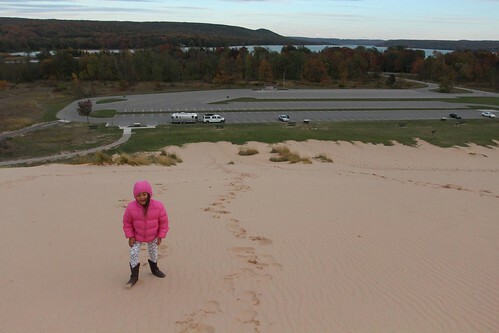 I am glad you made it up to Sleeping Bear Dunes. It would have been a shame to miss it completely as we were so close. It is a great place in the summer or the fall. Also, thank you for chronicling the complicated behind-the-scenes productions of my blog. Notice how I crouch professionaly to get my iPhone camera lined up just right. Hopefully, the weather will be nice for you guys next week in Ohio. Warm autumn days are among the best around here. The leaves are looking good right now. Lucy and the boys are looking forwarding to seeing your family again. Save travels.